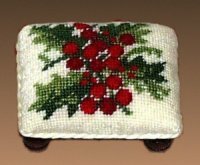 the Holly and Berries Footstool. 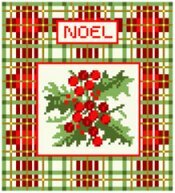 A green, gold, red and white tartan surround a large spray of holly and berries. 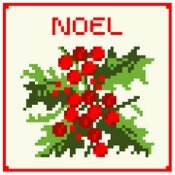 If you chose, you could substitute the word Noël with your family name or Merry Christmas or whatever you desire. Here is another holiday hanging for your decorating. 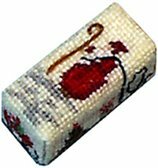 This also goes with the Holly and Berries Footstool. The colours are reds, greens and off-white. A Christmas tree all decked out with red decorations and a gold star on top is the subject of this hanging. The greeting is in red and blue snowflakes are scattered about. The background is off-white. This piece matches the Christmas Tree Stocking. A nice addition to your Christmas décor. This chubby gent is all ready to supply a nice green and white stocking and a plump wreath to your doorstep. He is wearing a blue coat and hat trimmed in white fur and has red mittens and black boots. Very cute! What a nice addition to your Christmas room or vignette! This pattern is a lively green holly with plump red berries on an off-white background. Only five colours in all. Simple but smart. There are a lot of images on this small piece and that's what makes it so special. On the front is an old-fashioned Santa with a staff in one hand and a reign in the other which loops around the side and winds up attached to a reindeer standing on the top end. On the other sides and end are an elf, a sleigh, packages and various bushes. Really cute! Finished Size is about 3/4" x 3/8" x 1/4"